Explore Korea, China, Japan and Vietnam on a journey bound for Myanmar, India and the UAE. Enjoy an inclusive three-day overland experience in Beijing, and multiple overnights in Shanghai, Ha Long Bay, Ho Chi Minh City, Singapore and Yangon. Nagasaki’s many memorials are a constant and poignant reminder of the fateful day in 1945 that changed the course of history. However, Nagasaki has demonstrated its resilience throughout the years, rebounding to become a flourishing,international city. In the late 16th century, Nagasaki traded with the Dutch, Spanish, and Portugese. The subsequent European and Christian influences are reflected in many of its churches, gardens, homes and museums. Dotting Nagasaki’s coastline is an array of outlying islands;a particularly spectacular sight at sunset, when the islands are bathed in the sun’s golden hues. Yangon (Rangoon) is the largest city and main seaport of Myanmar (Burma). Population, 1983) 2,513,023. Ancient Burmese culture endures in this exotic city on the Irawaddy River. The jewel of the city formerly known as Rangoon is the Shewedagon Pagoda, one of the world’s great Buddhist shrines, which is literally swathed in gold as well as diamonds, rubies and other precious stones. * All fares and savings are per person, in U.S. dollars based on double occupancy. Brochure Fares and Book Now Fares are cruise only and do not include taxes, fees, and port charges of $765 per person. Book Now Savings are subject to availability at time of booking. Book Now Fare includes Crystal Savings and does not include Crystal Society or Early Full Payment savings. Early Full Payment saving is based on the fare after all other discounts are applied. Optional Personal Select Air Program is available to purchase for full-fare, full-cruise guests whose travel originates from a U.S. or Canadian airport and includes all government taxes and fees. Note: Early Full Payment savings do not apply to Personal select Air. Solo Traveler fares are available upon request. Crystal Society Savings are per person based on double occupancy. All offers may not be combinable with other promotions, apply to first two full-fare guests in stateroom or suite, are capacity controlled, subject to availability and maybe withdrawn or changed at any time without notice. 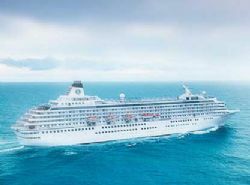 Crystal Cruises, LLC reserves the right to correct errors or omissions and change any and all fares, fees, promotions and programs at any time without notice.